HandTrucksRUs.com > Hand Truck Curb Ramps > Hand Truck Ramp Tread Plate 27" X 27"
Hand Truck Ramp Tread Plate 27" x 27"
The Liberator Aluminum Curb Ramp assists the operator with going up and over curbs, raised doorways, and up single steps. B&P's Diamond Tread Plate provides superior traction. Exceptionally light weight design makes for easy transport. * Lightweight, strong, and durable aluminum construction will stand up to years of heavy use. 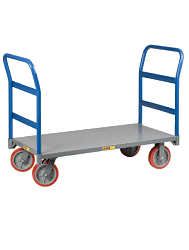 * Especially useful for movers or for deliveries that require several trips. Order this Curb Ramp today to eliminate the hassle of curbs and single steps during hand truck operation. Overall Dimensions 27 x 27"
Liberator Curb Ramp 26" x 18"
Liberator Curb Ramp 27" x 24"
Hand Truck Ramp 27" X 27"